It is not a big deal to catch a cold in winter. RBTH has gathered the ways to treat a cold in Russia. 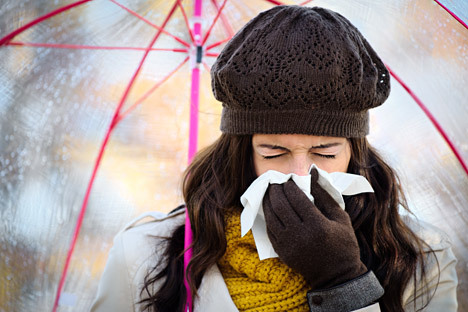 It is not a big deal to catch a cold in winter - especially in Russia, where winters are usually long and harsh. The prolonged cold weather and the constant probability of catching an infection prompted Russians to find various ways of treating a cold. RBTH has gathered the five most unusual ones. A raspberry jam. Source: Lori / Legion MediaIn Russia raspberry preserve is considered a panacea for a cold. From childhood everyone knows about the healthy properties of such a jam. Russian grandmothers are enthusiastic about making ill grandchildren drink tea with raspberry preserve. Lots of people even believe that, just by using this method, they can beat a cold without any medicines or antibiotics. However, doctors warn that using raspberry preserve alone is not enough to overcome 'flu or other infections, so people should not neglect more modern medication. An unusual way to treat a cold is by using garlic. It is known that garlic has unique antiviral properties. People often make beads from cloves of garlic and hang them on a sick person. These beads are believed to kill viruses that cause the disease. Another unusual way to use garlic in treating a cold is in nose drops. Garlic juice is mixed with water, after which the liquid is injected into the nose. This garlic solution is known as an effective cure for a head cold. Although doctors warn that garlic nose drops must not be used more than one or two times a day, otherwise nasal mucous membranes can become inflamed. The next unusual method to treat a cold is by steaming the elbows and knees. You will need two basins of hot water so you can immerse your elbows in one basin and knees in the other. At the same time you are supposed to add hot water to both basins (apparently with the help of a friend). It may not help you get over your cold, but a unique style of yoga is guaranteed. At the first sign of sickness many Russians go to a banya - a steam sauna - convinced there is no better cold treatment. It is believed that the hotter the steam is, the easier it is to overcome the disease. However, banya lovers also report discouraging experiences, when the experience not only did not bring the cold to an end, but even caused complications. That is why you should think twice before going treating a cold with a visit to the banya. A really weird folk remedy to treat a cold is by gargling with kerosene. Proponents say that only purified kerosene diluted with water should be used for this odd approach to tackling a cold. It should be noted though, that doctors categorically forbid the habit, which is more likely to seriously damage your health than help you overcome a cold. RBTH sides with medical professionals on this issue!